Can you believe that award season is nearly upon us? If not, you better wrap your head around it, because the Emmys are going to be here before you know it. The 70th annual award show will honor the best of the best in the TV world — Game of Thrones? 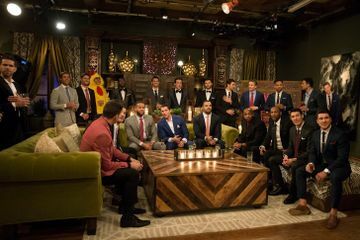 Queer Eye? The Handmaid's Tale? — when it airs live on Sept. 17. In case you need a refresher on why you should have this date highlighted in bright red ink, underlined in glitter, and circled in star stickers on your calendar, keep reading. Over the last few years, Hollywood has run into a bit of a hosting problem. 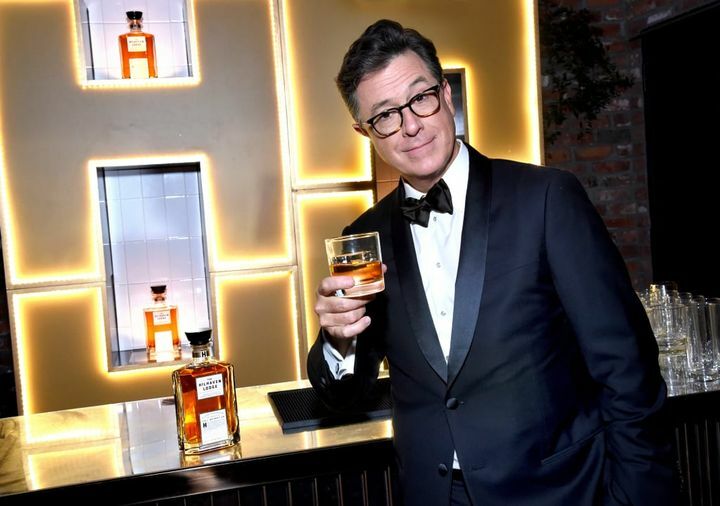 Gone are the days of celebrated sets from comedians like Billy Crystal and Bob Hope, and in their place are low-rated award shows lead by familiar late night personalities — Jimmy Kimmel, Jimmy Fallon, and Stephen Colbert. 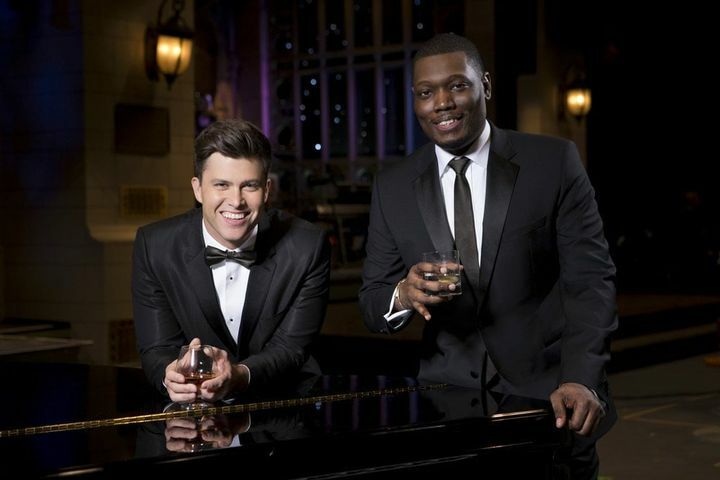 For this year's Emmys, the show went a slightly different route and decided on Saturday Night Live's Colin Jost and Michael Che, who host the sketch show's Weekend Update segment together. 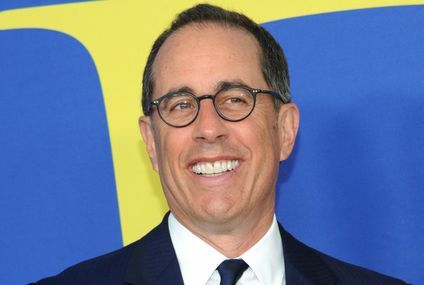 Their comedic chemistry is undeniable, and we have hope that they'll be able to replicate something akin to Nick Kroll and John Mulaney's consistently hilarious monologues at the Spirit Awards . . . because for some baffling reason Kroll and Mulaney weren't chosen. Fingers crossed! When the Emmy nominations were announced in early July, Sandra Oh became the first Asian actor to be nominated for the best actress in a drama category for her role on BBC America's critically-acclaimed Killing Eve. The dark, quirky spy series is easily one of TV's best (you can watch the first episode here! ), largely because of Oh's charming, raw, and vulnerable performance as MI6 agent Eve Polastri. The best actress race is tight, but we're holding out hope that she can pull through with a win. Like we said — this race is tight. 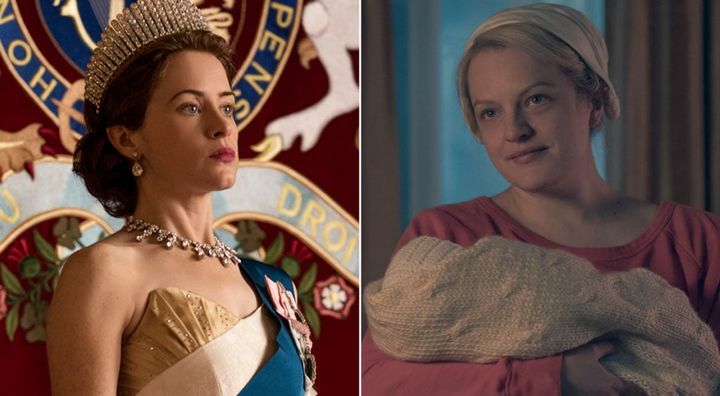 Competing for an Emmy alongside Oh is The Crown's Claire Foy, Orphan Black's Tatiana Maslany, The Handmaid's Tale's Elisabeth Moss, The Americans' Keri Russell, and Westworld's Evan Rachel Wood. Last year Moss took home the award, and in 2016, Maslany scored the honor. Every single one of them are at the top of their game — although, admittedly, Westworld's second season didn't earn quite the level of praise as its first did, which might not bode well for Wood. The best actress in a drama category isn't the only group with stiff competition. 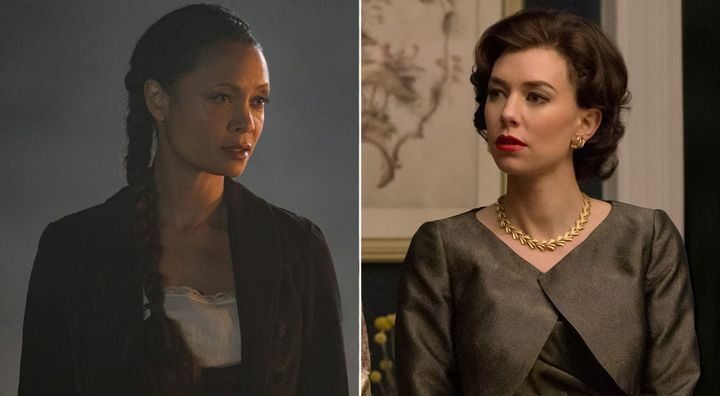 The talented stars going head-to-head for best supporting actress in a drama are as follows: Alexis Bledel in The Handmaid's Tale, Vanessa Kirby in The Crown, Millie Bobby Brown in Stranger Things, Ann Dowd in The Handmaid's Tale, Yvonne Strahovski in The Handmaid's Tale, Thandie Newton in Westworld, and Lena Headey in Game of Thrones. Dowd, who won last year for her brutal portrayal of Aunt Lydia, is up against two of her wildly talented costars in The Handmaid's Tale, a show that is beloved by critics. Then there's Newton and Kirby's delightfully smoldering performances in Westworld and The Crown, respectively, both of which are fan-favorites. As for Brown and Heady? The former was nominated for the same award last year, and the latter has been nominated for it three times previously — buzz about each of their roles might not be as strong as the rest of the actresses in this category, but they give consistently strong performances so it would be wise not to count them out. In the category for outstanding comedy is Atlanta, Barry, Black-ish, Curb Your Enthusiasm, GLOW, The Marvelous Mrs. Maisel, Silicon Valley, and The Unbreakable Kimmy Schmidt. All great shows? Undeniably. But two stick out as the frontrunners: Atlanta and The Marvelous Mrs. Maisel. Because Veep isn't in contention this year (it's won three years in a row), there's room for other shows to shine. 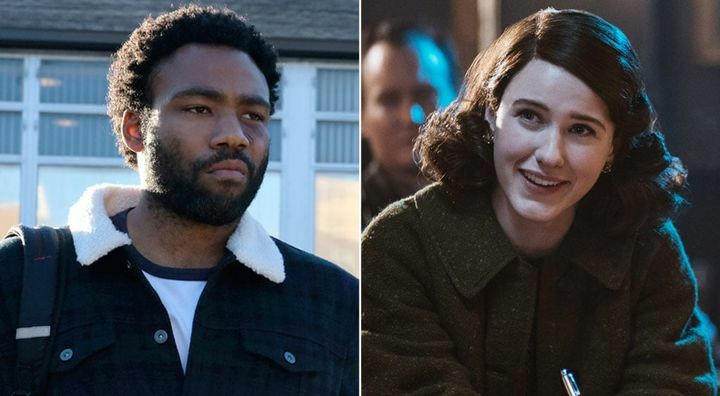 Donald Glover's dark comedy has already won big at the PGA and WGA Awards this year, but Amazon's stand-up comedy period piece from Gilmore Girls creator Amy Sherman-Palladino is a bonafide hit that earned star Rachel Brosnahan a Golden Globe in January. 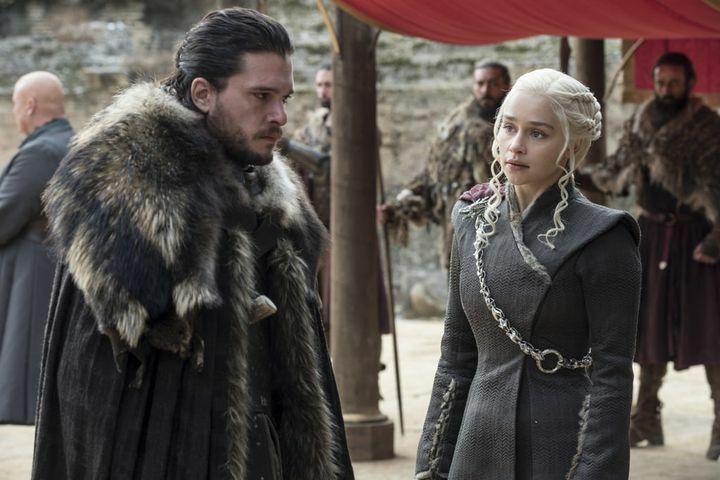 In 2017 Game of Thrones wasn't nominated for an Emmys because its July 16 premiere date made it ineligible, but can we expect a big return for the HBO fantasy series? So far, George R. R. Martin's baby has racked up an astonishing 38 Emmy wins and well over 100 nominations, and this year, there are notable noms for stars like Nikolaj Coster-Waldau, Peter Dinklage, and Lena Headey, as well as guest star Diana Rigg. The show itself is also in the outstanding drama category, so at the very least, we can hopefully expect the majority of the ensemble cast to show up and strut their stuff on the red carpet. 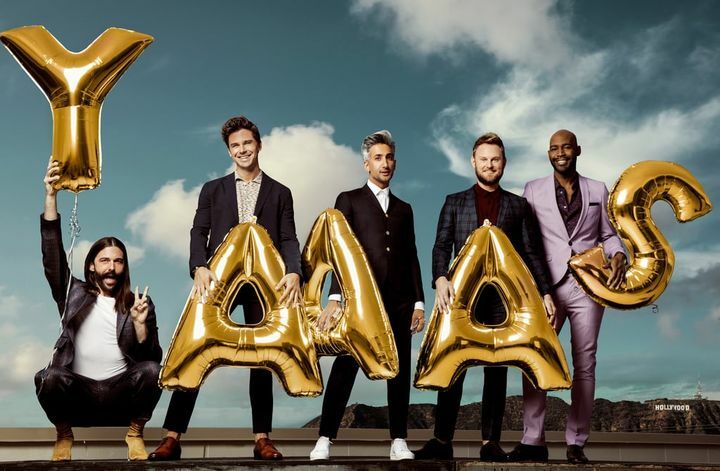 The first season of Netflix's Queer Eye premiered in February, and by the time season two arrived on the streaming giant in June, the series had exploded into a smash hit. The new Fab Five — Bobby Berk (design), Karamo Brown (culture), Tan France (fashion), Antoni Porowski (food), and Jonathan Van Ness (grooming) — sweep into the lives of Southern men and women in an energetic whirlwind of "Oh, honey! 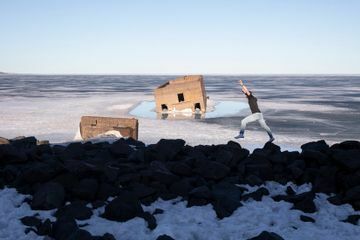 "s and shrieks, repairing and organizing their cluttered one-bedroom apartments just as easily as their fractured personal relationships. Their goal isn't to tear them apart, though. This is a kinder Queer Eye, one that focuses on building on the strengths of its heroes rather than nitpicking their weaknesses. It's exactly what's made the cast so beloved, and why seeing them take home an Emmy for outstanding structured reality program would be so satisfying. And you have to admit — they'd give the best group acceptance speech. While we don't know if the entire cast of Stranger Things will show up to the Emmys, it's not hard to assume given that the Netflix sci-fi series is nominated for outstanding supporting actor (David Harbour), outstanding supporting actress (Millie Bobby Brown), outstanding writing, and outstanding drama, among others. When they do show up together, it's always a guaranteed party, and it's also nice to see them out of their '80s costumes and all gussied up on the red carpet. 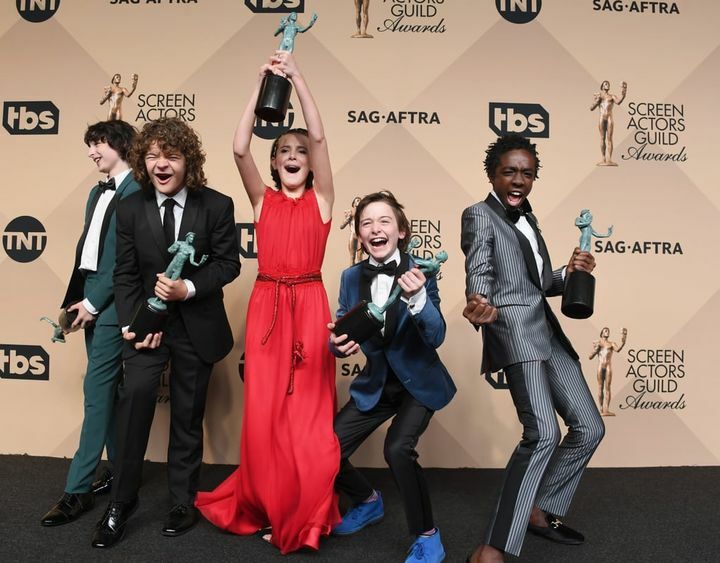 Just like the cast of Stranger Things, you can bet that whenever the stars of NBC's This Is Us show up to an award show, you're going to be treated to some pretty sweet moments. 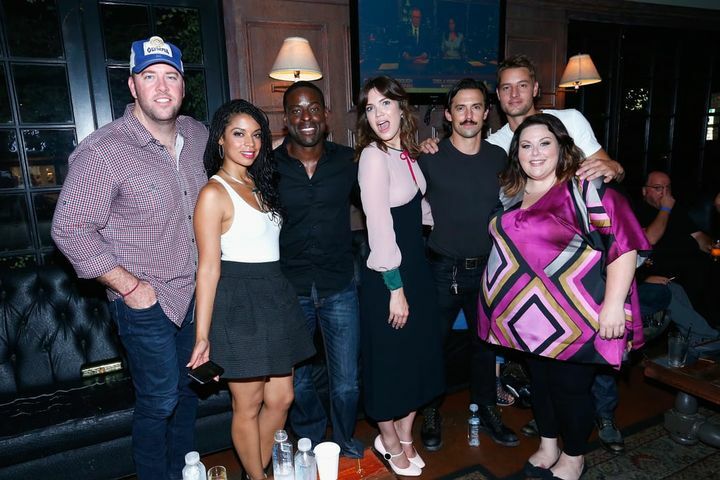 They play a family on TV, but seem just as close in real life (maybe because none of them have actually died from a heart attack after surviving a devastating fire, but who can know for sure). 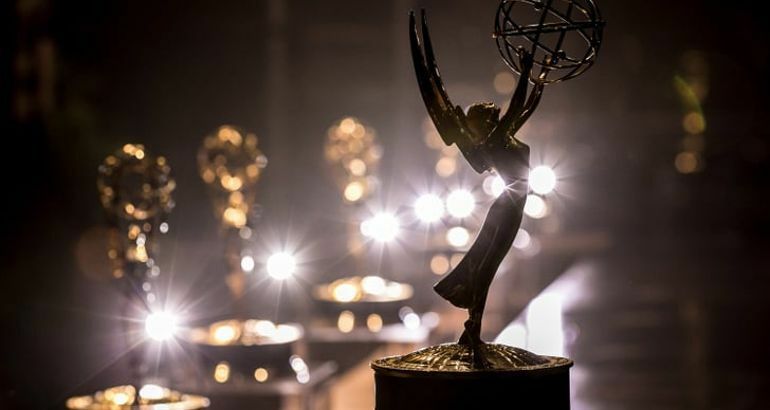 The show is nominated for outstanding drama, and picked up nods for stars Sterling K. Brown, Milo Ventimiglia, Ron Cephas Jones, and Gerald McRaney, so we can imagine they'll all be out in full force at the glitzy event. 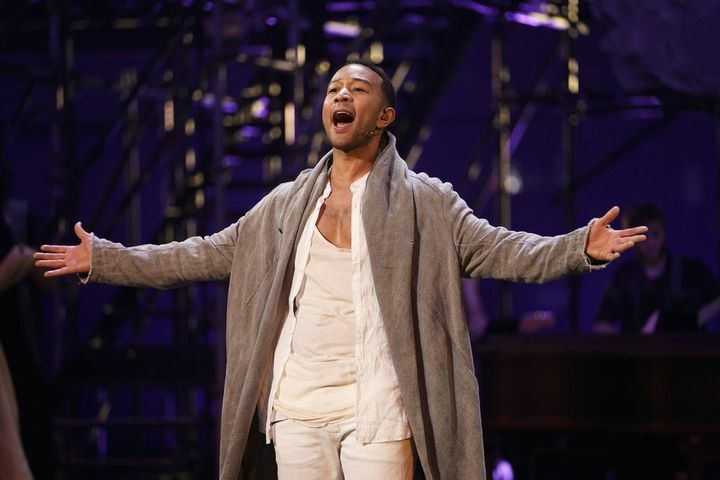 John Legend's nomination in the outstanding actor in a limited series or movie category for Jesus Christ Superstar Live in Concert is more important than you might realize. The 39-year-old is this close to completing his EGOT, aka winning an Emmy, Grammy, Oscar, and Tony. After taking home an Oscar in 2015 for his song "Glory" in Selma, winning 10 Grammys, and nabbing a Tony for coproducing the 2017 revival Jitney, all he needs now is an Emmy to finish off the rare Hollywood honor. 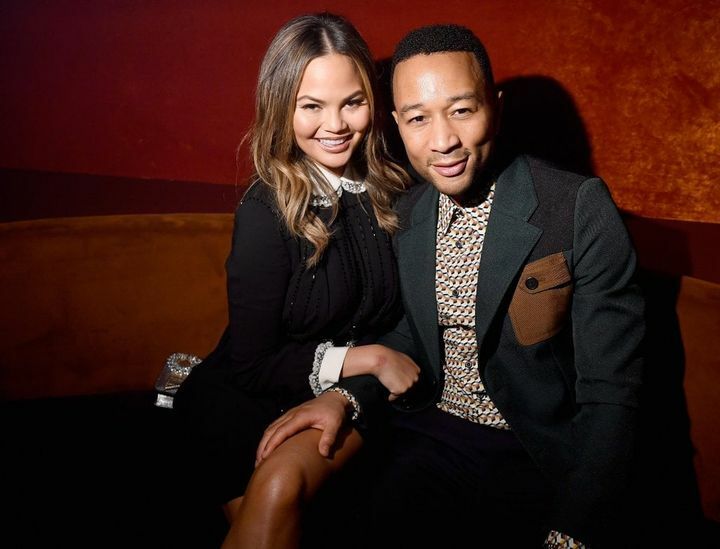 Speaking of John Legend, we know that since he's nominated, there's an almost definite chance that he'll show up with his wife: Twitter queen, cookbook author, and supermodel Chrissy Teigen. Not only do they make every award show significantly hotter, but also funnier (if we're lucky, we might even get another Arthur joke out of their night). While not every celebrity couple can be as perfect as these two, there are sure to be plenty of adorable, PDA-filled moments from fellow in-love attendees to keep things entertaining. Oh, sorry, did you think we were done discussing John Legend and Jesus Christ Superstar? Since the live musical aired on NBC and was praised for the jaw-dropping performances, we have a feeling the cast might reunite and belt out some tunes for the Emmys audience. 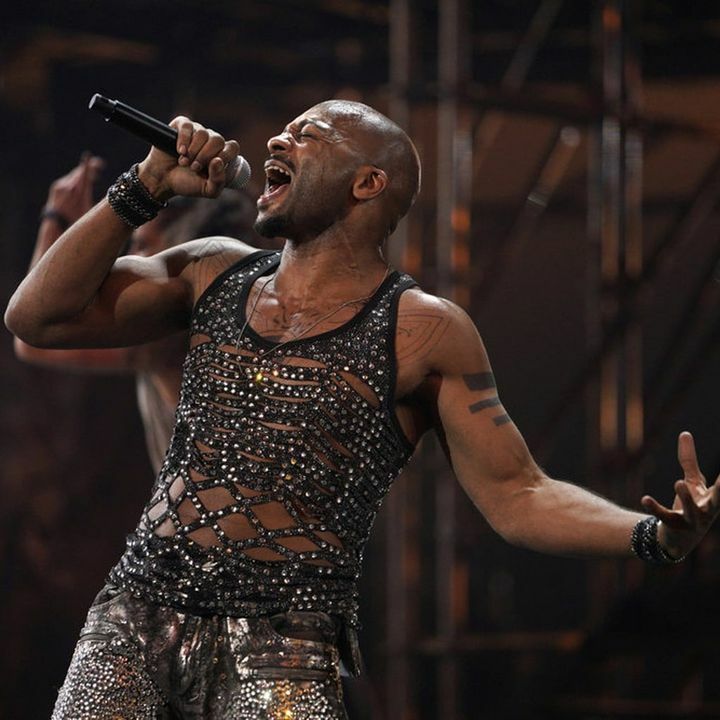 If Legend himself doesn't sing anything, we'd personally love to see Brandon Victor Dixon's Judas (above) sing another glittery rendition of "Superstar." 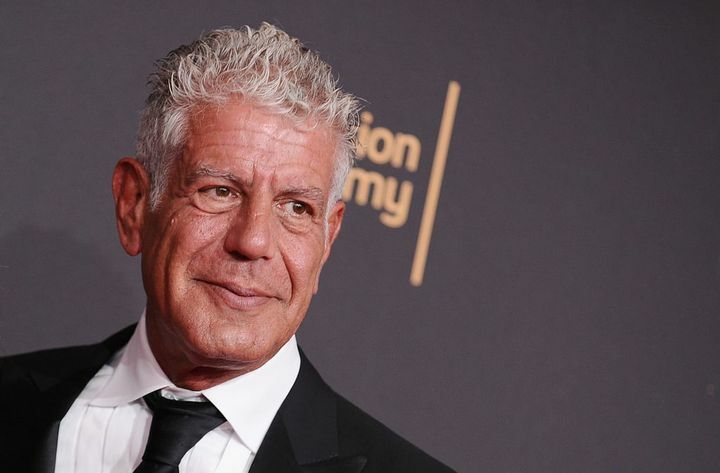 Anthony Bourdain ended up earning a posthumous Emmy nomination for Parts Unknown, which he hosted and executive produced. The travel and food-centric series scored six nominations overall, including best informational series or special, cinematography, picture editing, sound editing, sound mixing, and writing. As a bonus, CNN.com's Anthony Bourdain: Explore Parts Unknown was also recognized in the best shortform nonfiction or reality series category. The chef, bestselling author, and travel journalist died at the age of 61 in June, so it would be wonderful to see the Emmys pay respect to his work, as well as the careers of other celebrities who have passed away recently. The Emmys are all about groundbreaking achievements in TV, but we'd be lying if we said we weren't looking forward to seeing our favorite stars parading up and down the red carpet in style. Last year's colorful collection of gowns is going to be hard to top, but we have faith we'll be swooning over a ton of gorgeous looks in no time. What's award season without award show afterparties? The Emmys are a glamorous affair, but once they wrap up, we're looking forward to all the candid photos of stars enjoying their big nights out on the town.